What you see here is a triangle strip. 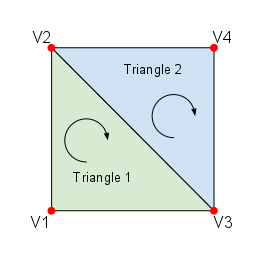 A triangle strip is a series of connected triangles, 2 triangles in our case. Grab the project from the previous article and create a new class called Square. Now change the GlRenderer so instead of a Triangle we use a Square. Examining this, the draw() method in the Square class should make sense now. First we enable OpenGL to use a vertex array for rendering. Our vertex array contains the vertices for our square. gl.glVertexPointer (line 5) tells the opengl renderer from where to take the vertices and of what type they are. The first parameter tells how many coordinates are used for a vertex. We use 3 (x,y,z). The second parameter tells that the values are of type float. 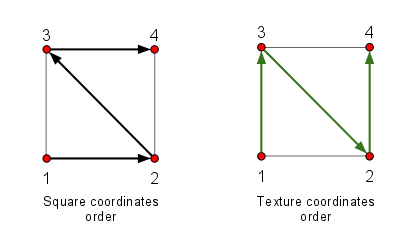 The 3rd parameter is the offset between the vertices in the array. It is called the strife. We have a tightly packed array so it is 0. Finally the last parameter tells where the vertices are held. Of course it is our buffer vertexBuffer. gl.glDrawArrays in line 11 tells OpenGL to draw the primitive. What kind of primitive? The one specified in the first parameter: GL10.GL_TRIANGLE_STRIP. It takes the vertices from the previously set vertex buffer and it follows the rules of the triangle strips described earlier. The second parameter specifies the starting index for the vertices in the array. The 3rd parameter tells OpenGL, how many vertices to use for the polygon, about to be rendered. Because in the previous statement (gl.glVertexPointer) we specified that 3 coordinates define a vertex, we will provide the length of our vertex array divided by 3. There are 9 elements in the array defining 3 vertices. glDisableClientState(GL10.GL_VERTEX_ARRAY) disables the state of rendering from an array containing the vertices. Think of glEnableClientState and glDisableClientState as begin … end statements in a program. We basically enter subroutines in the OpenGL renderer. Once we entered a routine, we set up variables (the vertex buffer, the colour, etc) and we execute other subroutines (draw vertices). After we’re done, we exit the subroutine. We work in isolation inside the renderer. Make sure you run the application at this stage and understand what is going on. Now the fun part. Let’s load up an image and create a texture. A texture IS an image. To find out how you can load up images in your android app, check out this article. We will be working with the Square class as we want to apply the texture to the square. 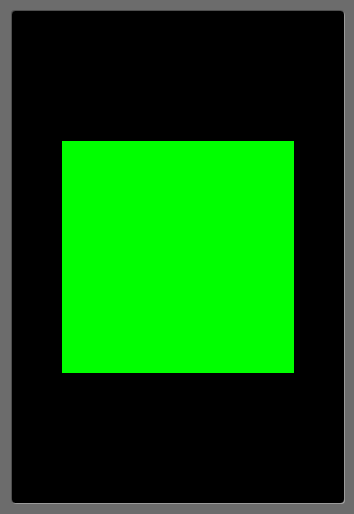 We need to load up the image, tell the opengl renderer that we want to use it as a texture, and finally we will tell the renderer where exactly onto our primitive (square) to display it. Think of it as if you were putting a foil onto a window or a wall. I provide you with a foil containing an image of the size of the window and tell you to cover the window with it, so the top left corner of the foil will be on the top left corner of the window. That is it, let’s get to work. OpenGL uses the vertices to work out where to put stuff. So we need to create an array for the image. But this time, this will be 2D as a bitmap is like a sheet of paper, a flat plane. Add the coordinate array for the texture. We will add an important method to the Square class. The loadGLTexture method. This will be called from the renderer when it starts up. It happens in the onSurfaceCreated method. This will load up the image from the disk and bind it to a texture in the OpenGL repository. It will basically assign an internal ID for the processed image and will be used by the OpenGL API to identify it among other textures. We need a texture pointer array. This is where OpenGL will store the names of the textures we will use in our application. Because we have just one image, we will create an array of size 1. Line 06 loads the android bitmap which was previously copied into the /res/drawable-mdpi directory, so the ID is already generated. A note about this bitmap. It is encouraged to be square. It helps a lot with scaling. So make sure your bitmaps for textures are squares (6×6, 12×12, 128×128, etc.). If not square, make sure the width and height are powers of 2 (2, 4, 8, 16, 32, …). You can have a bitmap 128×512 and it is perfectly usable and it is optimised. Line 10 generates the names for the textures. In our case generates one name and stores it in the textures array. Even if it says name, it actually generates an int. A bit confusing, but it is how it is. Line 12 binds the texture with the newly generated name (texture). What this means is, that anything using textures in this subroutine, will use the bound texture. It practically activates the texture. A bound texture is the active texture. If we would have had multiple textures and multiple squares to use them, we would have had to bind (activate) the appropriate textures for each square just before they were used to activate them. Lines 15 and 16 set some filters to be used with for texture. We have just told OpenGL what types of filters to use when it needs to shrink or expand the texture to cover the square. We have chosen some basic algorithms on how to scale the image. Don’t have to worry about this now. In line 19 we use Android’s utilities to specify the 2D texture image for our bitmap. It creates the image (texture) internally in its native format based on our bitmap. in line 22 we free up the memory. This you should not forget as memory on a device is very limited and images are big. Now let’s see how the draw() method has been modified. Line 03 binds (activates) the texture with the name (integer ID) stored in textures. Line 07 enables the texture mapping in the current OpenGL context. Line 14 provides the OpenGL context with the texture coordinates. After drawing the primitive with textures, we switch off the texture mapping along with the primitive rendering. If you look carefully, the vertex order in the texture mapping coordinates array doesn’t follow the order present in the square’s vertex coordinates array. 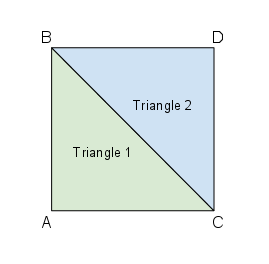 The square is composed of 2 triangles and the vertices are in the following order. Notice the counter clockwise path. Just bear this mapping in mind and rotate it if you start your shape from a different corner. To read up on UV mapping check the wikipedia entry or search the net for it. For the final part, to make this work, we need to provide the context to our renderer so we can load up the texture at startup. The onSurfaceCreated method will look like this. Line 03 loads the texture. The rest of the lines just configure the renderer with some values. You don’t have to worry about them now. You will need to provide the application context to the Square object, because the object itself loads the texture and needs to know the path to the bitmap. Just provide the context to the renderer in the Run activity’s onCreate method (glSurfaceView.setRenderer(new GlRenderer(this));) and it’s done. Make sure the renderer has the context declared and set via the constructor. Excerpt from the GlRendered class. 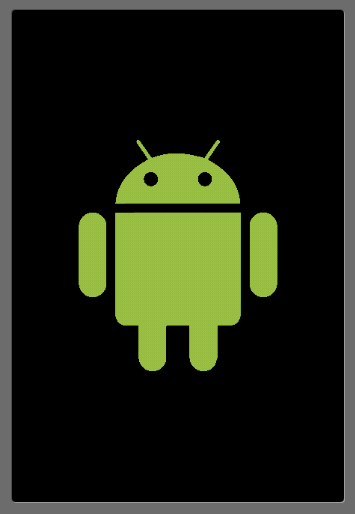 If you run the code you should see the square with a nice android laid on top of it.